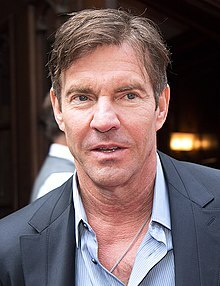 Dennis William Quaid (born Apryle 9, 1954) is an American actor kent for his comedic an dramatic roles. First gainin widespread attention in the 1980s, his career reboondit in the late 1990s efter he owercam an addiction tae drogs an eatin disorder. Some o his notable credits include Breaking Away (1979), The Right Stuff (1983), Wyatt Earp (1994), The Parent Trap (1998), Frequency (2000), The Rookie (2002), The Day After Tomorrow (2004), Vantage Point (2008), Footloose (2011), an Soul Surfer (2011). For his role in Far from Heaven (2002) he wan the New York Film Creetics Circle Awaird for Best Supportin Actor amang ither accolades. This page wis last eeditit on 12 Mey 2018, at 05:42.